Imagine turning carpet waste and old tires into new consumer products instead of piling up in landfills. Waste carpet and used tires are two of the biggest contributors to growing landfills. How can manufacturers create new products while repurposing these materials consumer use? SafePath Products in Chico, California is doing just that, creating innovative products combining recycled waste tires with waste carpet. An estimated 4 billion pounds of waste carpet is sent to landfills each year; roughly 300 million tires per year go to the same place in the United States. Of course, California produces a large amount of waste carpet and tire materials. 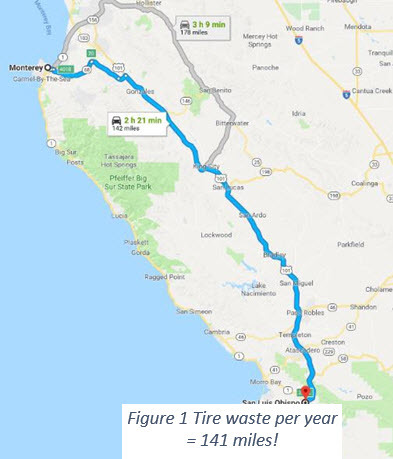 In California alone, more than 40 million passenger and truck tires per year, a staggering 480,000,000 lbs., are thrown into landfills. Waste carpet comes in at a close second at 390,000,000 lbs. per year. This creates a massive on already overburdened landfills. Tires alone equal 10,665 Semi-trucks filled each year to the brim. Bumper to bumper, these trucks lined up would extend from Monterey to San Louis Obispo (141 miles). 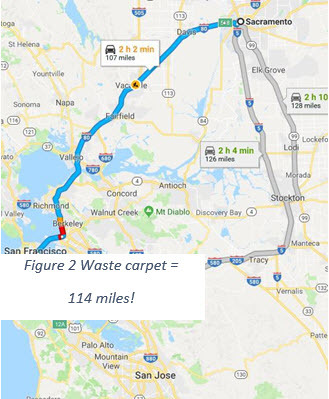 Waste carpet equates to 8,555 eighteen-wheelers, and from end-to-end, would extend from Sacramento to San Mateo (114 miles). When old carpets are cast-off in landfills, they biodegrade slowly, contributing methane emissions while leaching dangerous chemicals into the soil. Old carpets take up an estimated 3.5% of all landfills in the U.S. Waste tires also trap methane gasses in landfills and create a perfect breeding ground for mosquitos carrying West Nile virus and other harmful diseases. They are also susceptible to tire fires and negative environmental impact. SafePath Products offers an entire line of transition ramp products made from both recycled carpet and tires. They are also the first company to patent “recycled tire” transition products for the door hardware industry in 1997. Now they offer the largest selection of American’s with Disabilities Act (ADA) transition products in the world. With a unique blend of recycled tire crumb and ground carpet backing (known as PC4), mostly calcium carbonate, SafePath Products offers an extended line of products for the architectural marketplace. SafePath Products has focused on producing architectural products made from 100% recycled materials for over 23 years. These include flooring transitions on hardwood sports floors and other athletic field applications, made from 100% recycled waste materials. Figure 3 These many trucks filled with waste, why? access compliance for wheelchair ramps and flooring reducers for the building industry. The threshold ramp you see at doors or entranceways most likely came from SafePath Products, located in Northern California. The true innovation is in creating everyday products made from recycled elements by repurposing waste materials. “Consumers demand high quality merchandise made from recycled materials, and the challenge is to exceed expectations with materials drawn from various waste streams”, Vander Heiden said. with technical advancements to repurpose these waste materials into value-added consumer products.